3D printing, modular electronics and other new technologies make it easier to create customizable and innovative products for the end customers using ICT as a basis. 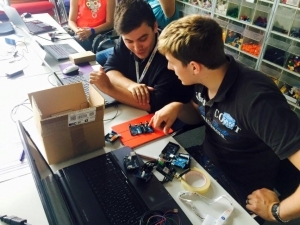 Using this opportunity, Fridrich-Alexander University and UnternehmerTUM organize Start-up Summer School on Internet of Things. This academy will be held in Nuremberg and Munich from August 18th to August 28th 2015. Students will get access to state of the art laboratories such as the Makerspace and Josephs. The academy is built around an interactive program with an emphasis on teamwork, hands-on learning, interactive workshops and industry visits. The summer school is aimed at undergraduate and graduate students with an entrepreneurial interest in Internet of Things. The academy will train future entrepreneurs to prototype products from promising ideas, as well as to design business models based on decentralized manufacturing and customer-driven approach. Whether you are a young maker or a budding entrepreneur interested in Internet of Things, we invite you to join the Bavarian Startiy7 academy! Up to Euro 100,00 (one hundred) reimbursement of travel expenses to reach Munich. The best teams of the start-up academy will get a chance to join the boot camp in Brussels, pitch their ideas and receive funding to realize them. So make the most of your summer with Startify7 and go on an entrepreneurial adventure!